Wear Green: Wearing green is the standard dress for St. Patrick's Day in America, even if the color is considered unlucky in Ireland. Pinch Anyone Who's Not Wearing Green: To truly be cliché on St. Patty's Day, you should pinch anyone and everyone who's not wearing green. Who cares if they're complete strangers or two feet taller than you – pinch away! Drink Green Beer: Drinking green beer is mandatory for a cliché St. Patty's Day. Why would you settle for an Irish stout like Guinness when you can have a festively dyed Miller Lite instead? Wear a "Kiss Me, I'm Irish" Pin: You can find these cliché pins at just about any store around St. Patty's. 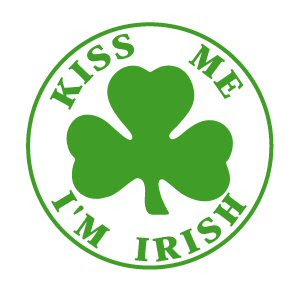 But just because your pin says "Kiss me, I'm Irish" doesn't mean you'll get that lucky. Eat Corned Beef and Cabbage: It doesn't get much more Irish (or cliché) than having corned beef and cabbage on St. Patrick's Day. You can order the dish at your favorite Irish pub, or better yet, make it at home. I have to admit that, even though I am 50% Irish in ancestry, I usually forget to wear green.. Ann makes up for it. I also do not pinch anyone, have never had green beer and I do not wear pins. But I do love to eat corned beef and cabbage.. sometimes even on March 17th. How about you? Will you embrace some cliché like behavior tomorrow? My wife Eileen makes the world's best corned beef and cabbage. Somehow this year our traditional family meal will grow to a 12+ person feast as our three kids have all decided to invite their friends. Bob, Bob, Bob, Bob - wearing green is not the standard dress for St. Pat's day. The standard color was blue. It only progressed to green. However, it is the standard color or dress for Catholics. Catholics wore green to show solidarity for one another. Orange was the standard dress or color for protestants who protested the catholic regime. White is the standard dress or color for those who desired peace and attempted to bring peace between Catholics and protestants. The Irish flag has three colors, orange for the protestants, green for the catholics and white for those who desired peace. The pinch is not for those who do not wear green, the pinch is a symbol of the pain of persecution that protestants felt by the catholics. So, in previous years I wore orange on St Patty's day, since I wasn't Catholic and would be classified as "quote a protestant." Then I began to wear white because I would like to see peace acheived between the two. I have never had green beer, but I will probably have a nice Irish pale ale tomorrow. My mother's family was Scots-Irish, so I will wear orange tomorrow. I agree with you about the beer. Give me a Guinness any day. I'm such a party pooper! I don't wear green, I don't drink beer, I don't wear pins, and won't be making the trational Cornbeef and cabbage. But I will have a cup of tea, and use the darling little creamer and sugar with shamrocks on them from my friend who brought them back to me from Ireland. But I think it's great for those that do celebrate....! I will probably pass on most of the things. (I would not mind the corned beef and cabbage but my wife hates cabbage and I am not sure what to wear after Gregg's comment.) But I will try to take some time off to consider the life of a man who was willing to go back to a people who had enslaved him to tell them about Christ.